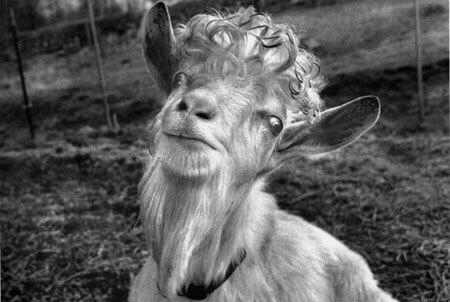 Sam is a goat, but not an ordinary looking goat. Despite his elderly appearance, this Saanen Swiss Dairy Goat is actually a young kid, less than a year old. David Dierks, the dairy manager at Grace Harbor Farms explained, "although every goat appears to look and act much the same, each has a very different attitude and distinct personality, just like humans." Observing Sam more closely now we see that he looks verifiably different for two distinct reasons. First, our Sam is having a bad hair day. Second, he's nearly crazed from the major physical and psychological trauma he has just experienced. He and his brother Solomon have had their manly horns removed to prepare them for their roles as the sires to the nearly 40 goat milking herd. Life can be truly challenging for all of us who share the earth. Giving others respect and common decency endows us the grace to see the goodness in all creatures.